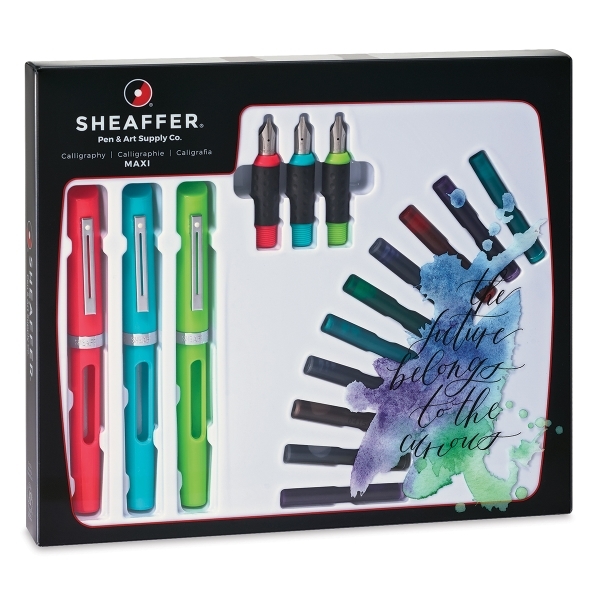 Sheaffer's next generation of calligraphy pens feature brightly colored barrels, color-coded nibs, updated caps and clips, and windows that display ink color and level. For beginning and experienced calligraphers. Includes one pen, one nib, and two cartridges. One-year warranty. This set includes three pens, three nibs (fine, medium, and broad), and 20 ink cartridges (three Black, three Blue, three Blue/Black, three Brown, two Green, two Purple, two Red, and two Turquoise, plus a tracing pad and an instruction book. ® Sheaffer is a registered trademark.® Viewpoint is a registered trademark.